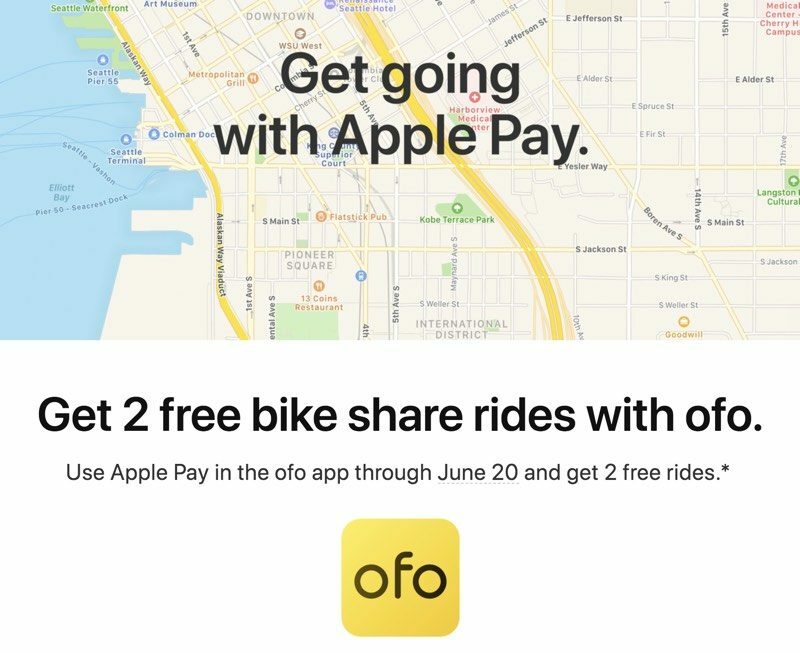 Apple today shared a new promotion that will allow Apple Pay users to get two free bike rides through the ofo app from now until June 20. Ofo is a smart bike sharing service that's designed to let users pick up and use a bike for short trips around various cities where ofo bikes are available. The ofo service operates in multiple countries around the world, including the US, the UK, Australia, China, Japan, Malaysia, Russia, Thailand, Singapore, Spain, Italy, Portugal, the Netherlands, Czech Republic, Israel, Austria, and Kazakhstan. The Apple Pay deal is, however, limited to the United States. Ofo normally charges users $1 per hour to borrow an ofo bike, with Apple Pay providing two $2 off coupons that are good for two two-hour rides with the promo code "Apple18." Each coupon is available for seven days after the promo code is used and will be applied to the next two rides when available. Apple Pay must be selected as a default payment method before the code is applied, and riders who download the app and get a free trial should wait to apply the code after the trial ends. In addition to promoting ofo, Apple's most recent Apple Pay email highlights other transit-related services including Lyft, LimeBike, ParkMobile, MTA eTix, Ventra, and MBTA mTicket.